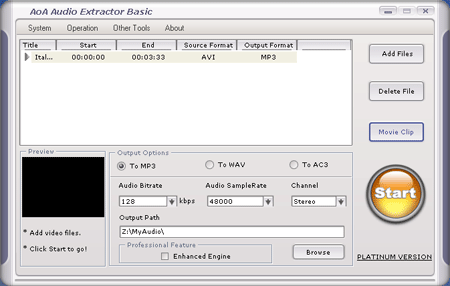 AoA Audio Extractor is a Free tool that can be used to extract audio from video files “Video to Mp3” for example. It also supports extracting audio from AVI, MPEG, MPG, FLV, MOV, WMV, MP4, DAT video files and saving the extracted audio as MP3, WAV or AC3 files. Other key features include adjustable audio bitrates and audio sample rates and, the ability to select a only a portion of the video for audio extraction. Note: You can uninstall the installation from your PC after you are assured the portable installation works.